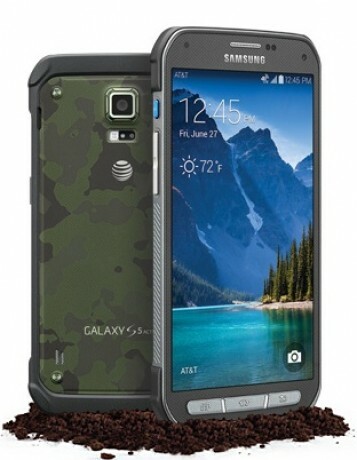 AT&T and Samsung today announced the Galaxy S5 Active, a ruggedized variant of Samsung's flagship smartphone. The GS5 Active carries over many of the GS5's key specs, including the 5.1-inch FHD screen, 2.5GHz quad-core processor, 16-megapixel camera, and built-in heart rate monitor with S Health software. The GS5 Active has, however, been wrapped in a tougher exterior to provide extra protection from the elements. The GS5 Active meets mil-spec 810G, which means it can withstand high heat, extreme cold, shock, vibration, high altitude, and humidity. The GS5 Active can also sit in up to 3 feet of water for up to 30 minutes. Samsung added one neat software trick to the GS5 Active: a press of the convenience key on the side will launch all the apps related to outdoor activity on a single screen. The Samsung Galaxy S5 Active costs $200 with a new two-year contract, $27.50 per month on AT&T Next 18, or $35.75 per month on AT&T Next 12. It can be ordered online and in stores beginning today.